Daily Rental Leads January Fleet Sales Increase - Cox Automotive Inc.
As expected, U.S. new-vehicle sales in total were down in January compared with a year ago, but they came in a tad higher than many had forecasted. They likely got a bump for more-than-anticipated fleet sales, notably sales to daily rental car companies. Total fleet sales rose 10 percent in January, led by a 16-percent gain to daily rental companies and a nearly 6-percent rise to government fleets. Commercial fleet sales declined by nearly 2 percent in January after a significant 9-percent gain in full-year 2018 due to the business benefits of tax reform, which won’t be repeated this year. Of total fleet sales, daily rental car sales represent the biggest volume – about 1.7 million sales in full-year 2018. 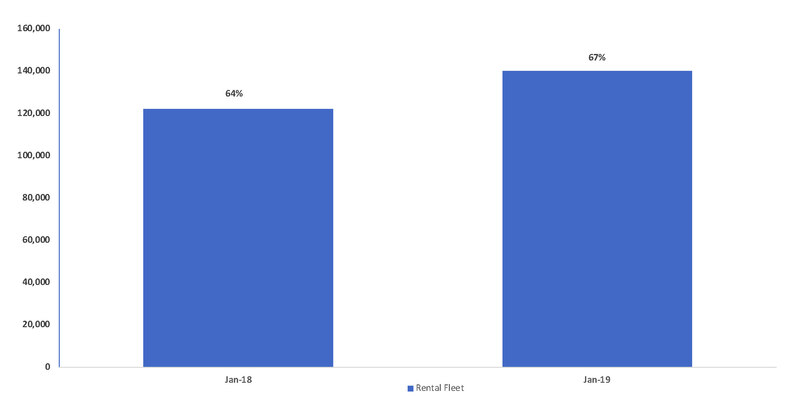 In January, daily rental accounted for 67 percent of all fleet sales, up from 64 percent in January 2018.